From maintaining a scorecard history to providing an on-course GPS that helps identify hazards, to giving the ability to book a tee time right from the palm of your hand, and giving access to our app loyalty program, the Redwoods App was built with our customers in mind! The App creates an even better all-around experience for our valued guests; it creates another platform for communication between Redwoods and our customers, as well as provides our guests with easier access to Redwoods from the very device that so many people spend their days on. Experience Redwoods in a way you didn’t think possible. Download the app today to start seeing Redwoods in a new way! 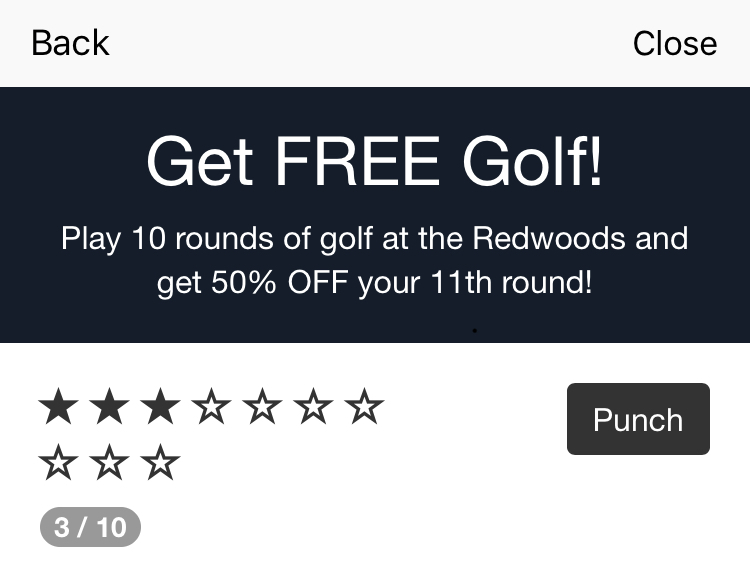 We have a Loyalty Program built right into our Redwoods Golf Course App! By downloading the App and signing up for the Loyalty Program you can earn DOUBLE the rewards! Over the last few years, we have been running a loyalty points program where customers earn 5% of every $1.00 they spend on anything here at Redwoods. These rewards accumulate automatically in our system and can be redeemed on future green fees. With our new App, we DOUBLE what we are giving back to our valued customers! Once you sign up for the App Loyalty Program you will receive a virtual punch card. Every time you purchase a round of golf, you get one punch. After playing 10 rounds, your 11th round is 50% OFF! Here is the kicker: with each round of golf you pay for you are still earning 5% back with our automatic loyalty points program. By the time you have gotten to your 11th round of golf (which is now 50% off if you've been using the app) you can use your loyalty points to pay for the remaining 50% of your green fee--ultimately giving you a FREE round of golf! It may sound a little confusing, but trust us, it's simple, requires very little effort, and gets you closer to FREE GOLF everytime you play at the Redwoods!! What are you waiting for? Download the Redwoods Golf Course App and sign up for the App Loyalty Program today! Questions or concerns? Call the Golf Shop and we will be happy to help!